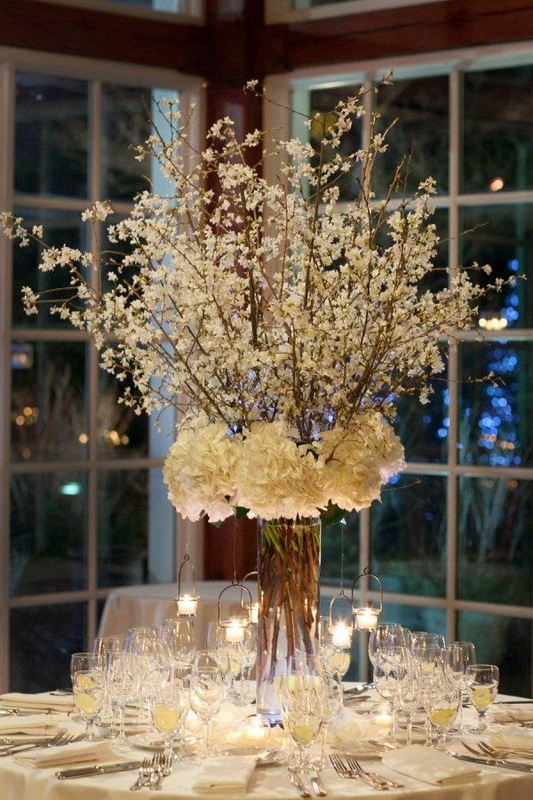 As with most of the images on Pinterest, this centerpiece is stunning. We love it and wish we could do this every month of the year! However, (you knew it was coming) these blooming branches are really only available in the spring months. The exact weeks/months will vary year to year due to weather factors. For instance, if an early spring freeze occurs in one region, all the flower buds on the blooming branches at several farms may be wiped out. The remaining branches at other farms will then be in high demand due to lack of supply. Likewise, a warmer than normal spring can also be a challenge. Though we all like a warm week in early spring, it can cause premature blooming in whole crops of branches. If it warms up enough, trees will bud and bloom in a very truncated period of time, causing a shortened blooming branch season. This would be bad news for someone hoping for blooming branches in mid-May for instance. This image gives a very soft, ethereal-looking sense to the space. A similar vessel and non-blooming branches could be used with the same base of hydrangea at the opening of the vase. Then, tall, linear flowers could be incorporated into the branches to soften the whole arrangement and mimic the blooming branches. The overall look and feel would be very similar and would have applications far beyond the spring months. As with any inspiration picture, flexibility is key to achieving the same general feeling. 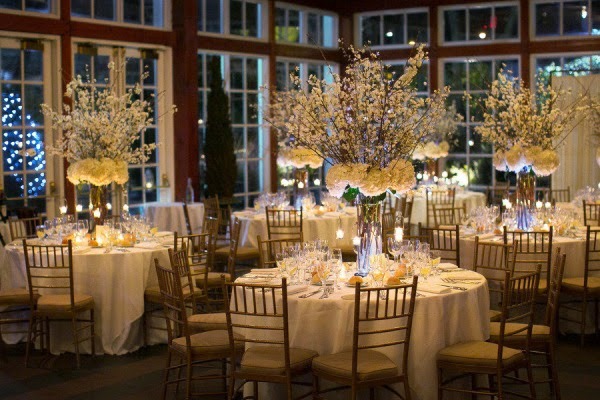 Don’t become discouraged if the blooms in your favorite photo are out of season for your wedding. Just be willing to take suggestions about how to make the next best thing available your new favorite.